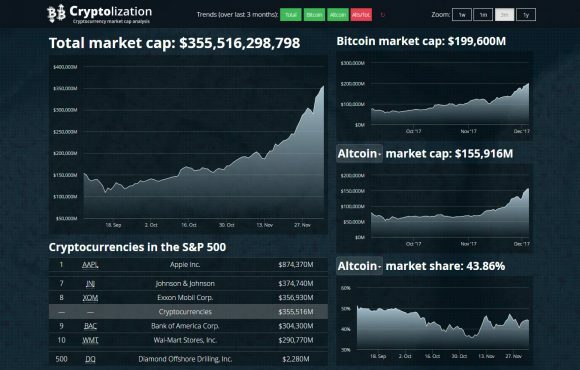 If you are looking for a quick and easy overview of the total crypto market cap in USD, as well as what is the current Bitcoin market cap in USD and check how altcoins fare versus Bitcoin in terms of market share you might find Cryptolization to a be a pretty useful tool. There is even a quick check where are cryptocurrencies currently positioned in the S&P 500 index to see how they fare in against some of the largest companies in the world. There is still a lot to be desired from crypto currencies in terms of market capitalization and the potential for growth is really huge, but if you look into the stats you can see that things are moving pretty fast already.